Details on how astronomers in W. Europe, with clear skies, a telescope and a bit of luck, can spot asteroid 2015 TB145 on 31 October. Michael Khan, working at ESA’s Mission Analysis Office at ESOC, Darmstadt, Germany, contributed to this blog post. The diagram was prepared by ESA’s NEO Coord Centre, ESRIN, Italy. A word of caution: Due to illumination, its size (it is not visible to the naked eye and unlikely to be seen with just binoculars) and its flyby trajectory, spotting 2015 TB145 will require a decent telescope and some level of skill and experience. To know where to look, you will have to compute the location from your specific location using JPL Horizons, as explained below. An asteroid four times the size of a football pitch will miss Earth on All Hallows’ Eve. Asteroid 2015 TB145, an object some 400 m across, will pass safely by at around 17:00 GMT (18:00 CET) on 31 October. The space rock was discovered only on 10 October from Hawaii. On 11 October, just 12 hours after its discovery, the object was first confirmed by ESA from its observatory in Tenerife, Spain (full report via ESA web). Using JPL Horizons, which is a web application hosted by NASA/JPL, and using numerically computed (i.e. 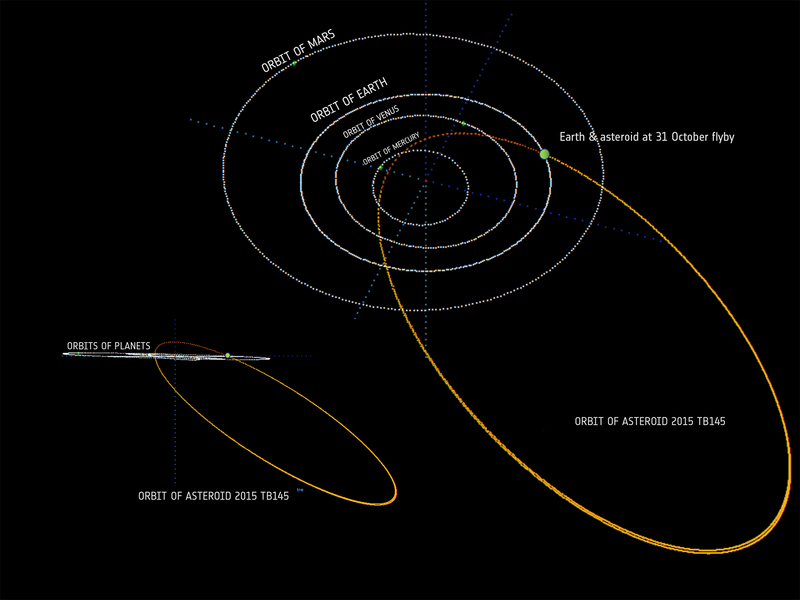 accurate) trajectories, asteroid 2015 TB145 will be geometrically observable – above the horizon after sunset – on 31 October 2015 between 16:10 UTC and 20:50 UTC. At 16:10 UTC (17:10 CET) it will be closer than 500 000 km, but also, the sky will still be rather bright. This will be during twilight and the asteroid will be located in the sky toward North by North-West. The apparent magnitude given by Horizons is +10.24 mag (which is fairly faint). At 18:00 UTC (19:00 CET) twilight will be over, but the asteroid will have reached a magnitude of +11.2 mag (fainter) and it will continue moving farther away and getting fainter from then on. What’s more, the asteroid will be visible only at a fairly low elevation on that evening – distinctly less than 20 degrees above the horizon from Germany (so the chances of observing it may be hampered by a lingering evening haze). Even with a really dark sky, we can see objects down to around mag +6. We won’t have a dark sky at these times, but even if we did, it wouldn’t make a difference for the naked-eye observability. Every digit of increase in the magnitude means a decrease in the brightness by a factor of 2.5. This means that between +6 mag and +10 mag, we have a factor of almost 40. The asteroid would have to be at least 40 times brighter than it is in order to stand even a fighting chance of becoming visible to the naked eye. In fact, even 40X brighter wouldn’t be enough on 31 October because the sky won’t be dark. I’d rule out binoculars, too. So, while it won’t be visible to the naked eye, for anyone with a telescope, it should be visible, observation conditions (haze, etc.) permitting. Editor’s note: If you spot it, and get a photo, post it via Twitter (using the #HalloweenAsteroid hashtag), or send us the link as a comment to this blog post (below), and we’ll share the best ones! The space rock was discovered only on 10 October from Hawaii. On 11 October, just 12 hours after its discovery, the object was first confirmed by ESA from its observatory in Tenerife, WHY THAT LATE?